There is only so much information that a text document or report can convey. When dealing with a lot of information - especially numbers - having a visual interpretation is key to relaying the proper message and moving forward. Business professionals should be able to have a physical, analytical summary of their progress in order to maximize the efficiency of their plans moving forward. Whether it is a map that charts your entire strategic plan, or a massive chart to plot all of your information, Magnatag has the progress tracker or sales whiteboard to meet your needs. Being involved in goal tracking can usually mean different things, depending on your organization. It is important that regardless of your industry you buy a progress tracker that is clean, simple, easy to use, and ultimately effective for your requirements. Magnatag's options can be simple and straight-forward, or more intricate for those larger projects. Our products can fulfill any of your needs, for any organization, company, industry, or individual. We have numerous goal tracking & performance scoreboard options. Some of our products are representative of the classic thermometer looks which are great to visualize progress in a fun manner. It is always enjoyable seeing your progress finally reach the top! Other of our sales whiteboards available for purchase here online can be very product or project specific -- what we offer comes in a wide variety of uses so anything you need to be charted, we are able to provide not just the product, but also a great customer experience to make sure you are completely satisfied. Magnatag offers a multitude of different chart options which cover a variety of tasks or procedures. We offer options which are great for tracking equipment and where each item is, up to simpler, smaller charts just meant for data and number entry. Our products can be used for long-term entry to track entire projects or years, or more basic projects that involve just raising money for one time. 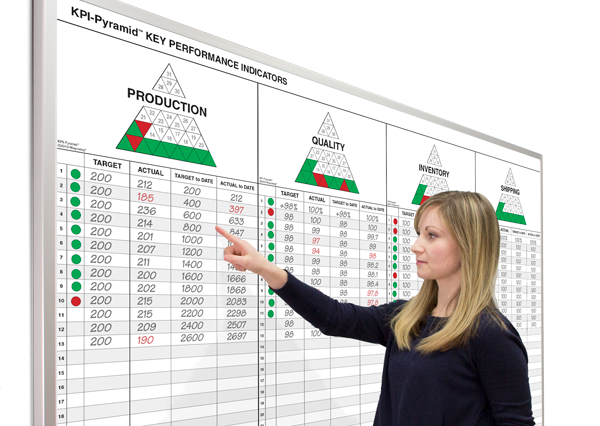 If there is something where just writing down information, sending emails, or remembering details won't be sufficient for you, then Magnatag's goal tracking whiteboards are the tools your company or organization could benefit from to ensure your project is top-quality.